Hi, what coil ( or coil wick) does this RDA use? Discussion in 'New Members Forum' started by vapeboi777111, Jan 19, 2019. Sorry, i am new to vaping. i bought this "SXK Solo Style RDA 1:1 Vape1 squonk mod"
Just about any you want to use. Avoid coils over 3mm inside diameter, and under 2.5mm inside diameter. 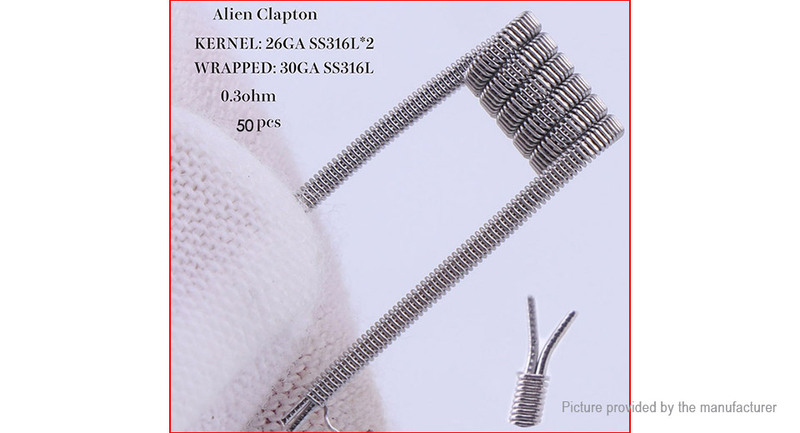 The type of coil you use is up to you. The only thing is that depending upon the wattage/voltage and /or temps of the mod your putting this rda on, you had better have a thorough understanding of Ohms Law so as not to blow your hand or mouth off! I'm using a Dead Rabbit RTA, with dual 0.36 ohm coils. My coils fit the tank and don't get shorted. You have to watch that. My mod for these coils attains 200 watts. However, I have the temperature set to 250°F and it works awesome. As I'm using "Stoner's Delight" by: "Vapes Gone Wild", the flavor is just absolutely unbelievable! You are limited only by your imagination, your coil and wick installation skills, and yeah, the size of the chamber, don't go putting a 10 mm coil in there, it's not gonna fit. Also, sometimes it can be good to watch (some) reviewers build and wick your new tank. it can (in some cases) be useful as far as just building and wicking it generally. Otherwise, play around to your heart's content although I will say (even though I'm playing around a bit t the moment with more exotic coils, for fun) they are not necessarily better than a simple round wire build. Etc. One important thing: What mod are you going to use it with? Regulated, non regulated, mechanical? Stick to Kanthal, 0.5 ohm coils for the time being. You might need to stretch coils a little bit to make it fit. I'd start with something like this. "Avoid coils over 3mm inside diameter,"
Can't agree with that. As long as the coil isn't touching/shorting the atty out what size coils you can use in them is your choice. I have ran a SS316L-26 4mm (inside diameter), 5 wrap, .45Ω coil with 4mm RxW in it since day one in a SXK Black Solo without any issues (on a Pico Squeeze when out and about on wee hours of the night errands). I also have 3mm (and 1.7mm) RxW that could be used in it, but I like big coils for my DLH's. @vapeboi777111, as a new vaper safety first should be considered (especially if you use mech mods). If you don't have an OHM Resistance Reader to check your atty for shorts after it's coiled and BEFORE you put it on a mod and fire it, they are cheap insurance for as little as $6-$7. If you already knew this, well, it was offered just in case you didn't. I notice the post screws are missing in the pic. Without those it won’t use anything.